Watercolor on paper, 52 x 35 cm (20.5 by 13.8 in). Signed, located and dated „Munich 1879“. Gallery stamp „Carl Grünwald, Munich“ on the reverse. Decorative period frame. Dimensions framed: 71, 5 x 55, 5 cm (28.1 by 21.8 in). Provenance: Gallery Carl Grünwald, Munich; Dr. Waver, Privat Collection, Berlin. The artists belongs to the so-called "Munich School", primary as architecture and landscape painters. He studied at the Polytechniken in Vienna and Stuttgart and, since 1866 painting as a pupil of August Schäffler in Vienna, also at the Academy in Venice from 1868 until 1870 and since 1872 as pupil of Otto Seitz in Munich. Literature: H.C. Ebertshäuser, Münchner-Schule, p. 251; Thieme-Becker, vol XXIX, p. 214; Friedrich von Boetticher, vol 2, p. 493 (listed at no. 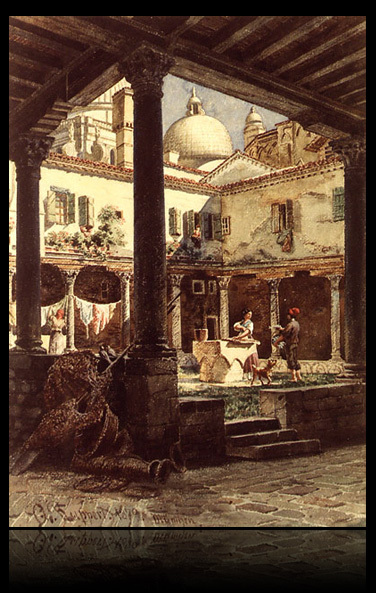 11 also a painting by Otto von Ruppert with the title "San Gregorio. "); Bruckmann Lexikon der Münchner Maler im 19. 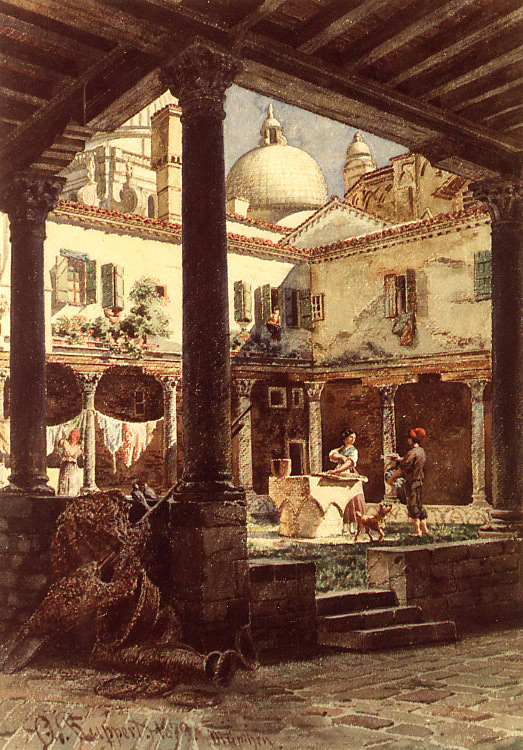 Jahrhundert, vol 3, p. 408, Fig; Gemälde aus der Privatgalerie des Prinzregenten Luitpold, (Paintings from the private gallery of the Prince Regent Luitpold), Munich 1913, p.57 f.
The present work depicting the beautiful and famous inner courtyard of "Abbazia San Gregorio" in Venice at the 19th Century. A charming Italian watercolor in fine original condition.